The child in this picture has a smile on his face as he is looking up into heaven. From the center of his chest shines a light that symbolises Love Harmony and Peace. 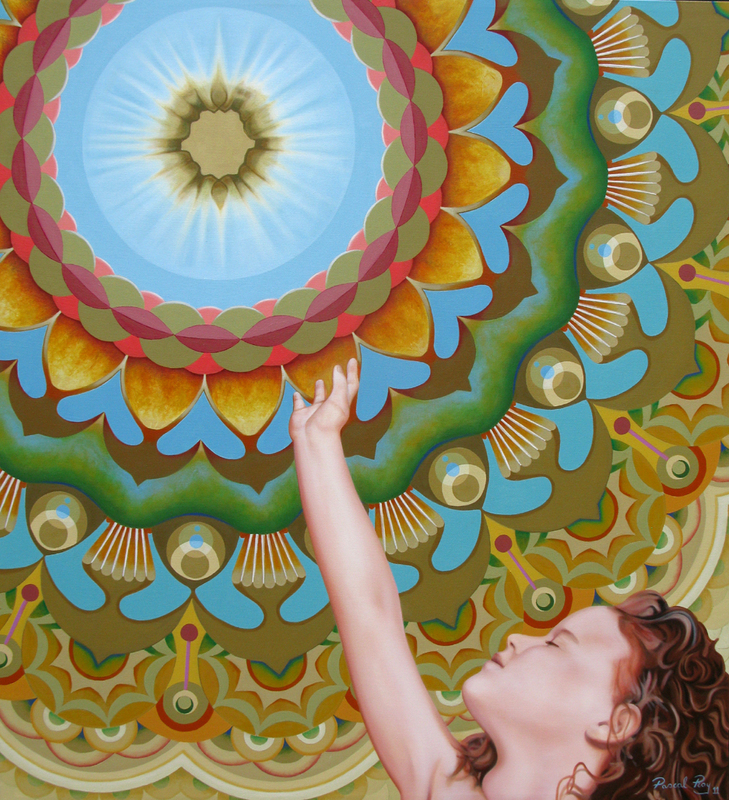 I named this painting Anahata witch is a Sanskrit word that means Heart chakra. The color associated with the heart chakra is a vibrant emerald green. 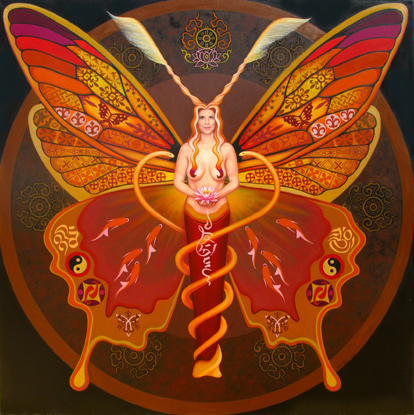 The fourth chakra, the heart chakra, rests in the center of the chakra system. It is the balance point, integrating the world of matter (the lower three chakras) with the world of spirit (the upper three chakras). Anahata symbolises the consciousness of love, empathy, selflessness and devotion. On the psychic level, this center of force inspires the human being to love, be compassionate, altruistic, devoted, and to accept divine actions. 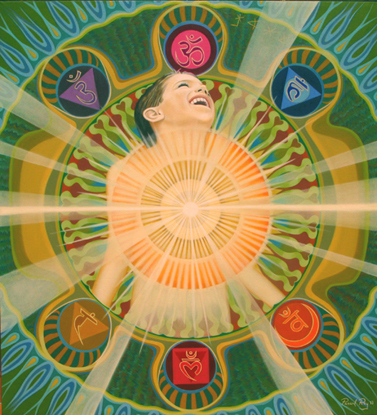 In Anahata, one is making decisions, 'following your heart', based upon one's higher self. Music without words means leaving behind the mind. And leaving the mind is meditation. Meditation returns you to the source. And the source of all is sound. Kadir Music has always been a very special part of my life and I am thankful for the experiences I have when listening to it. It seems to me that the spiritual nature of music is that music is a reflection or mirrored image of something heavenly of this world. Music can take us someplace and take us away from our troubles. The Universe is more like music that matter. Here is my latest painting, completed last week. A commission painting made for the studio of a professional DJ from New-York city. 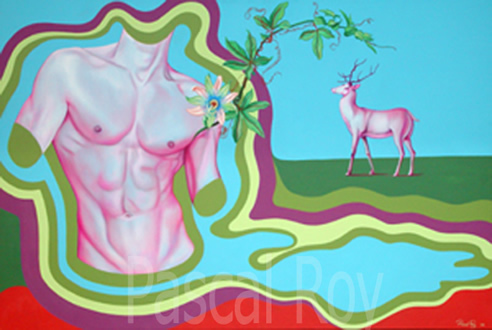 The title is `Passion for Music`, 120 cms x 160 cms, oil on canvas. I don`t always have a clear idea of the image when I start a painting. I just put the pencil on paper and then on the canvas, from there I start creating lines and shapes, letting the composition appear. It is very intuitive even if the final result looks as if a lot of thought has gone into it. As part of this project, I have taken some pictures to show the stages of the painting process from beginning to end. The sequence is showing only 12 pictures but it took me more than 12 days to paint this. 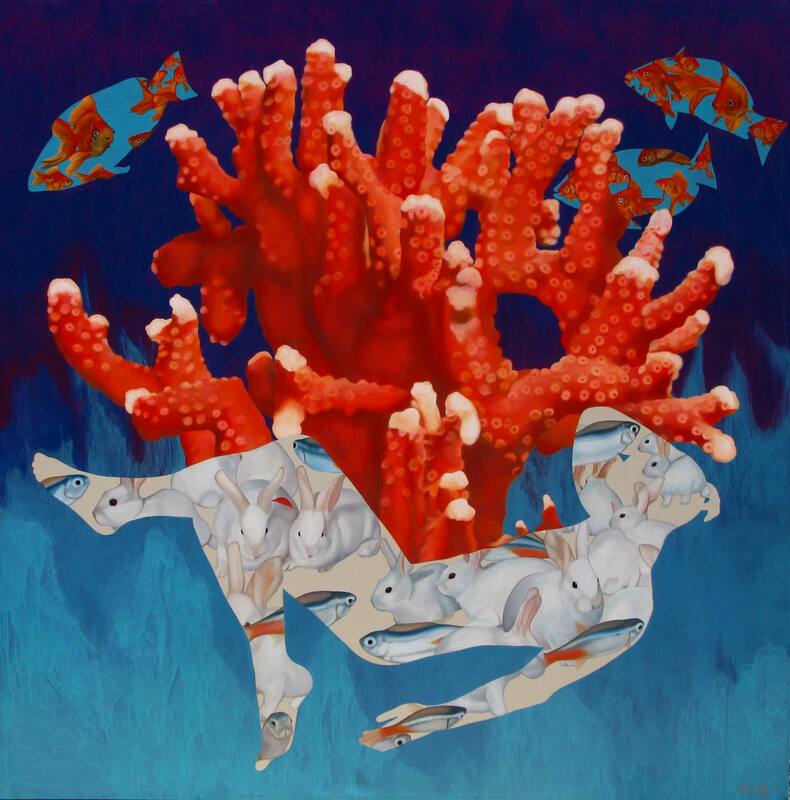 I paint in lots of layers, the image constantly changing as I go. Until, arriving to a point where the painting say to me, “I`m done”. Enjoy music in your life........ it is so powerful because it is a spiritual art. Portrait of Angie. 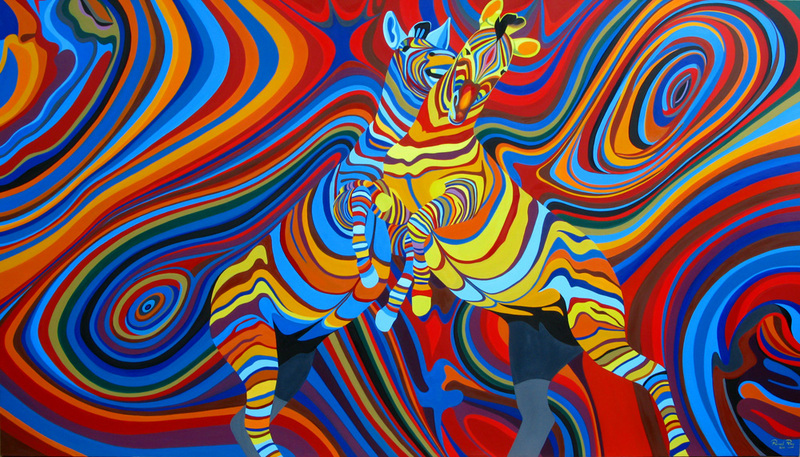 This was a commission painting. In your interactive life, think of yourself as an empty tunnel, a hollow flute. When air flows through you, when thoughts glide through you, what comes out as your breath, your words, your actions is melodious, healing music. You are the flute through which the Divine plays the song of life. As the reed can be made into a flute, so the human heart can be turned into an instrument of the God of Love. This is your purpose—to bless yourself and your loved ones with the symphony of peace, of joy, every single living day. "There is a light that shines beyond all things on Earth, beyond us all, beyond the heaven, beyond the highest, the very highest heavens. This is the light that shines in our heart." Upanishads quote. 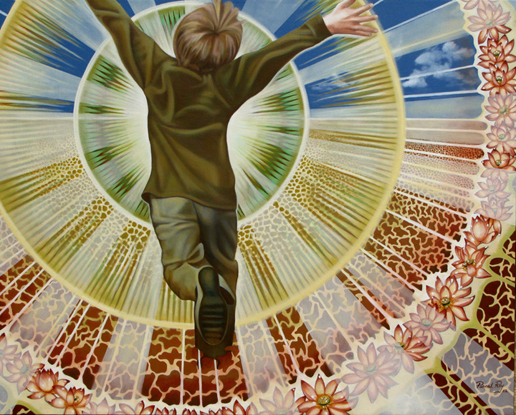 Description: A child is running in a field, stretching his arms to the sky, his heart expand like a flower coming into full bloom, expanding with warmth golden white rays of light. The rays of light represents his soul unfolding and the joy of this moment of bliss. 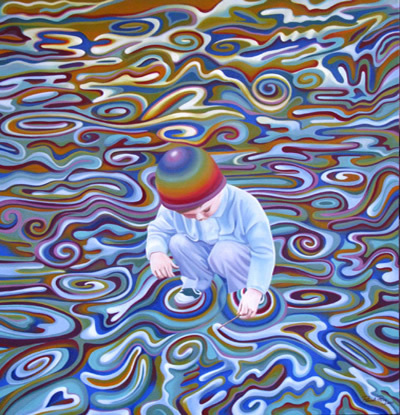 This painting represents a child playing in water with a stick. The message in this image is how we create our life, the magic of creativity. One can build his life in color with the spirit of the child that lives in each one of us. In an interview I saw on youtube, the speaker was talking about extraterrestrial beings and the view they have on God. He was explaining that the ET`s do not see God like a human being does but more like a color. They explain that the color Magenta is the most elevated color of the spectrum. That was the inspiration for this painting. 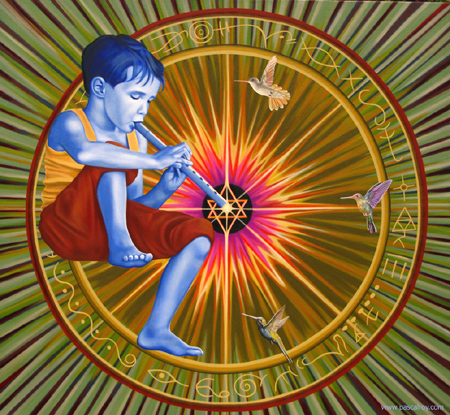 In this image, the boy is holding a brush in his hand, painting a seed of life (sacred geometry). On his right se can see a tree that represents The Tree of Life, a sacred tree which bear all seeds . This image is made of 3 circular canvases that make one beautiful wall decoration. The painting on the left has the title: Germination. The one in the middle is called: Gestation ............The one on the right is called: Birth. This painting is made of 20 separated panels that make one unique image on the wall. They can be displayed as shown here or in different order as the viewer wants. 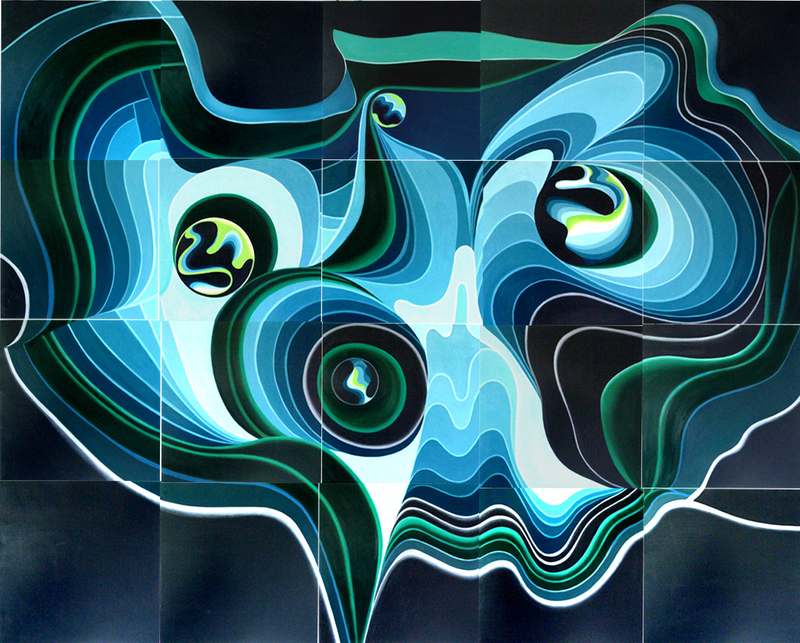 The theme of this painting is Water. 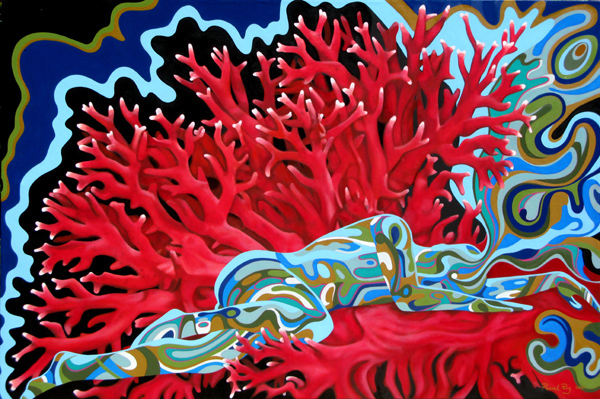 I painted it during the rainy season with the thought about the importance of Water in our systems and around us. There is no more beautiful experience than when the world expands beyond its accustomed limits. These are moments when reality takes on splendour. My happiest memory from my childhood is the time I spent outdoors, cycling, walking in the woods or playing on the beach. 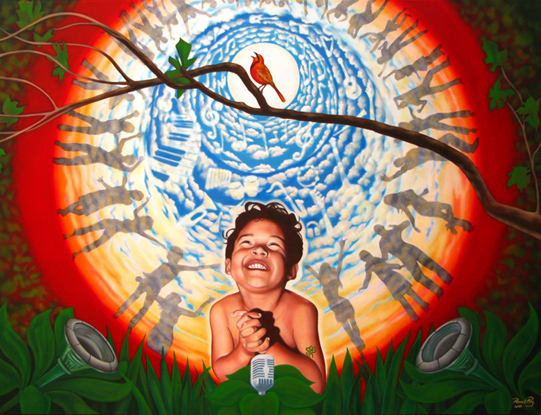 One of my most vivid memories is one of that I was swinging high up in the sky while singing on the top of my lungs.In this painting I wanted to represent that feeling of happiness and also how your consciousness affects your reality.I got inspired by the Tarot card of “The World”. They say about this card that the woman stands on air (here on a swing), symbolizing that the spirit supports her endeavours. The four guardians surrounding her ( try to find those figures on the painting ), suggest that by serving the powers that they represent, they are now at her service. 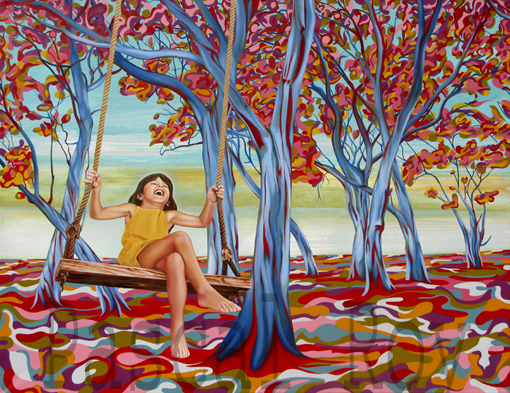 My favourite series of painting involves a fantasy world with happy children. 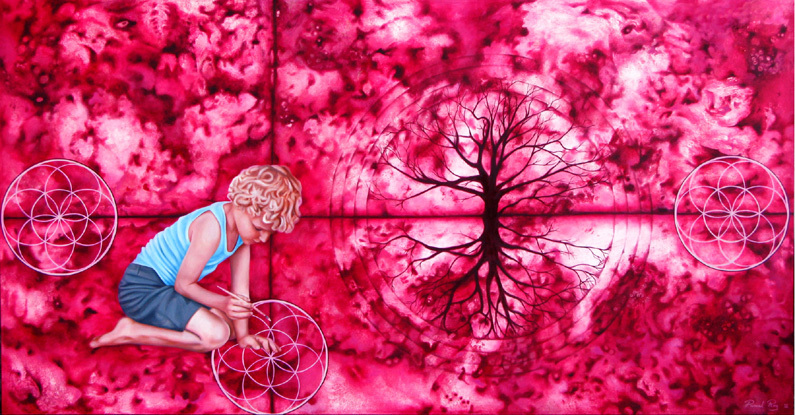 The children I paint, in many ways, represent the innocents and the curiosity each of us still have inside. 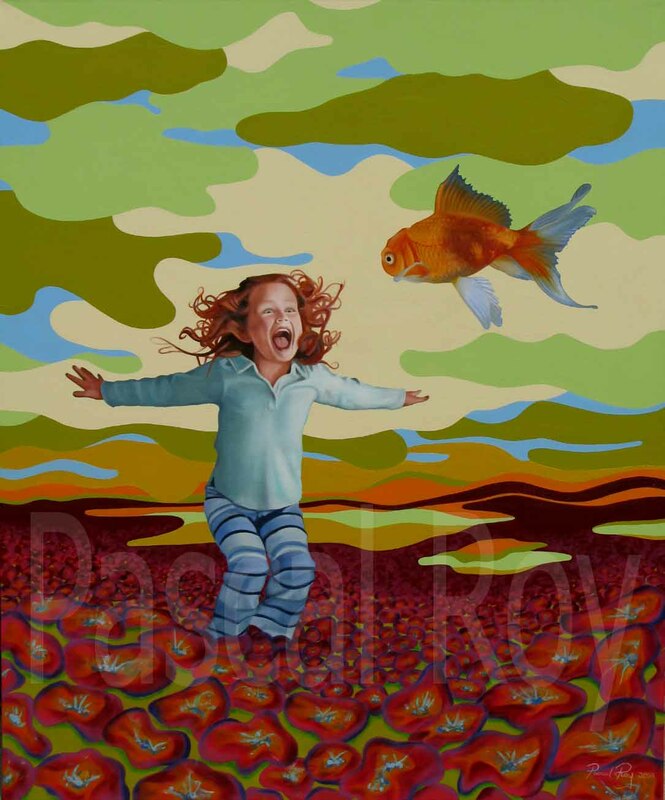 The fantasy of actually being able to fly and the freedom and happiness that I imagine is a theme that I often paint. 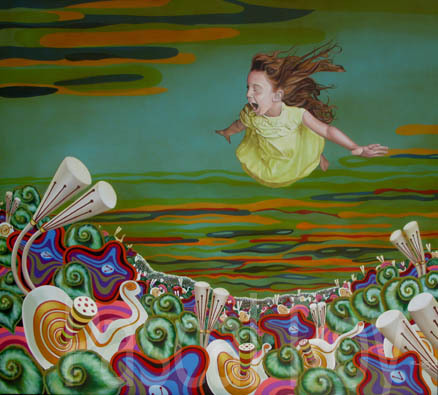 In the painting called DREAMLAND there is a young girl flying over a garden of psychedelic flowers. We can see in her expression the feeling of joy and wonder as if both the little girl and the garden are conscious of each other.